It's a shame really. You are an expert with your business and you have so much information. Your customers need to hear from you! So why aren't you talking to them? Why aren't you sharing your wisdom in a blog? Never struggle with blog topics again! Who wants to hear from me? Look, I get it. You are busy running your business and blogging just isn't high on the list. Come on, these are excuses! Don't take the easy way out. You are too smart for your customers to miss hearing from you. 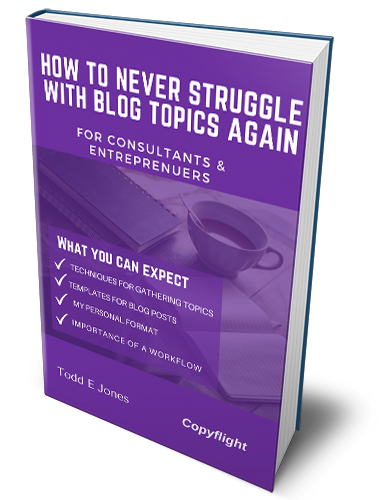 In Never Struggle with Blog Topics Again, we will shatter each of those excuses by giving you the tools to never struggle with a blog topic again. Don't know how to blog? I've got you covered. We have included five templates -- actually they are formats -- that you can use today. When you are finished with the ebook, you should easily have at least 30 blog post topics to begin writing.